Good news: It's SPRING BREAK! Bad news: I'm still battling this dumb cold! Good news: At least I don't have to work with this dumb cold! Bad news: But I also had to call off our trip to Houston. Good news: Ryan and I got to take in an afternoon movie yesterday. What a treat to see Oz in 3D and XD! Bad news: The film had its scary moments (for little kids, anyway), but the truly terrifying parts came with that tickle in the back of my throat. Will the coughing stop? Will I have to leave the theater? Did I bring enough cough drops? Strange how the anxiety of worrying about the coughing seems to make the coughing worse. Hmmm. Good news: We still managed to go to one of my favorite places, IKEA, today. We picked up some bookcases for the game room, and lunch was outstanding because—hello?—LINGONBERRY! 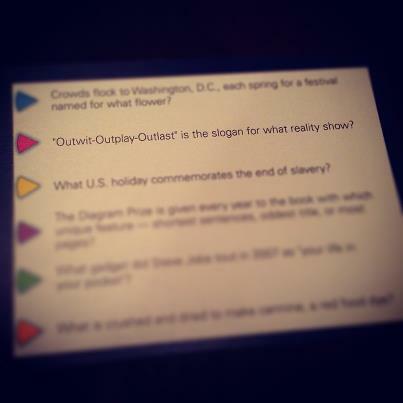 Good news: Tonight we finally got to play Trivial Pursuit with Nana. Our near-monthly games have turned into quarterly events, but we love it when we get the chance to sit around her table and get those wedges. Bad news: The Cough That Would Not Die didn't seem to care about my gameplay and would strike at will. Can you believe Ryan got this question? Too funny! Aw, who am I kidding? Even a cold and a cancelled trip can't dull the luster of spring break. In spite of the cough drops and Kleenex, regardless of the mild jealousy that surfaces every time I check Facebook and see my world-traveling friends, this break is AWESOME. After so many years in education, I take these holidays for granted, and I really shouldn't. As teachers, our days are long and we're always bringing work home. When we get these school breaks, we should bask in the downtime. That's been the plan this week, even if this cold has forced me to be "down" for more time than usual. Viva downtime! Viva spring break!